An immersion blender is a super duper helper in the kitchen. Plus, it stores well. For years and years I scoffed at the immersion blender. Whatever the info-mercial promised, I wasn’t interested in. I had a food processor. What more did I need? Fast forward a few dozen years and I found myself recipe testing for my freezer cookbook. During bulk cooking sessions I found myself lugging out the food processor and all its parts to clean in order to purée a multitude of soups and sauces. Since a freezer cooking session involves so many dishes, I was willing to do anything to reduce that load. Especially when I was bulk cooking on a weekly basis. Enter the immersion blender, aka stick blender. It was love at first soup. Not only did the immersion blender allow me to blend a soup without dirtying more dishes, it also did it lickety-split. What previously was a 20-minute process that made a huge mess became a 5-minute breeze. A quick rinse of the wand in hot water and clean up was done, too. If you make your own soups and sauces, you will appreciate the ease of use that an immersion blender provides. Plus, it compactly stores in a kitchen drawer, making it a perfect asset to a small kitchen. In fact, you could easily use the immersion blender for smoothies and other drinks in place of a traditional one if storage space is at a premium. I’ve also used the immersion blender to disguise vegetables into tomato sauce before making chili or minestrone. That chili my family scarfed down? Yep, full of eggplant and summer squash. But no one knew because I blended it in the big metal soup pot. Bwahaha. I bought mine, a Cuisinart Smart Stick on Amazon for about $20 a few years ago. I watched it for several weeks before I took the plunge. It has totally been worth the investment. 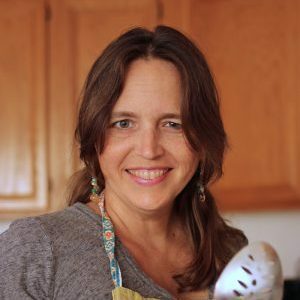 What’s your experience with an immersion blender? My immersion blender is one of my top two kitchen tools (the other being my stand mixer). I love it! Love! I have a Braun hand blender that I got as a wedding gift 20 someodd years ago and it is still kicking. It has a tiny crack in the flange around the blades but I won’t replace it unless it dies because I’m afraid they “don’t make ’em like they used to”. I’m afraid they probably don’t. I want to love my immersion blender. I really, REALLY want to love it. Alas, I do not. 🙁 I have a Cuisinart that was highly rated on Amazon. I was SO excited to get it a couple Christmases ago. But it just doesn’t cut it for me. I find it time consuming and I hate having to stand there holding it. It’s never as thorough as my “real” blender and, at least half the time, I wind up resorting to using the regular one anyway. I know so many people who sing their praises, so maybe I just got a dud. @JessieLeigh, I kinda think you did get a dud. Bummer. @Jessica, I second the dud notion! I bought a Cuisinart stick at Costco, and it died within months (or at least seemed to just stink at its job!). I bought a replacement a year later, and I’ve been happy since! I do loathe frozen strawberries in the smoothie cup. The blender works WAY better, but for everything besides strawberries, my replacement is amazing. AND I do LOVE the small 1 cup processor that came with mine. I always whirl ground meat in it, in small batches, from the skillet into the processor into the crockpot of chili or spaghetti sauce. The smaller pieces stretch the meat further. I love it! I love mine, too! And we used to make smoothies all the time. Throw a handful of frozen sliced strawberries in a tall cup, slice in a banana, fill about 1/2 way with OJ and blend. That was my favorite!! I’ve been eyeing them for awhile, and your post convinced me to really watch for a deal for an immersion blender of my own. I love mine! We got ours with Kohl’s cash we received from buying our stand mixer. 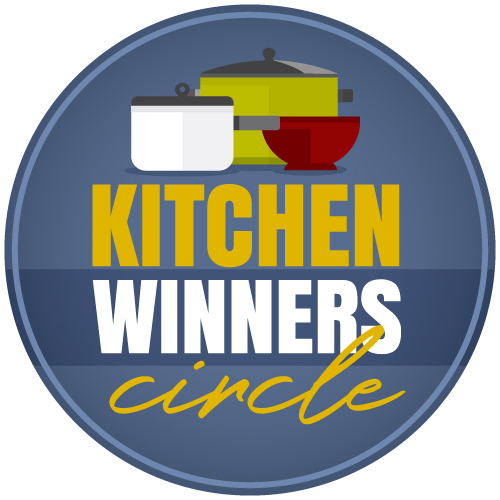 It has been awesome for soups and sauces. I haven’t tried doing a smoothie with it yet but our blender is dying so I think I’ll have to give it a try today. @Grace B, awesome to get one “free”. the thing i use mine most often for is crockpot applesauce. i peel the apples, use my apple wedger to slice them, throw them in the crockpot with a little water, vanilla, and cinnamon. cook on low for 4 hours and then i take my immersion blender and turn it into yummy applesauce without anything extra to wash. sometimes i can the applesauce according to the ball blue book directions, sometimes i freeze it, and sometimes it gets eaten too quickly! @missy, I’d forgotten about applesauce. Yes! I use mine mainly for baby food…what ever we are eating is what baby is eating!! So simple and no prepackaged baby food to buy!!! It can break the bank. Extra veggies after cooking for yourself? Whir them up…instant puree for baby! Can’t say enough good things about my stick blender!! Love mine. It is an awesome way to sneak veggies in without the kids knowing and it makes the canning season so much easier. I love mine too and wouldnt want to do without! I’ve got the same version you have in brushed steel. I puree my cauliflower bisque in a jiffy and I also use it a lot when Im making crock pot apple butter.. Talk about a lifesaver. At one time I had a cheaper model from Wal-Mart or somewhere, and while it worked pretty good, (not as good as the Cuisinart) it had a problem with oil leaking out of it.. it was disgustingly gross.. I tossed it. I dont need motor oil in my food. I’ve given these as gifts too and everyone has loved them! 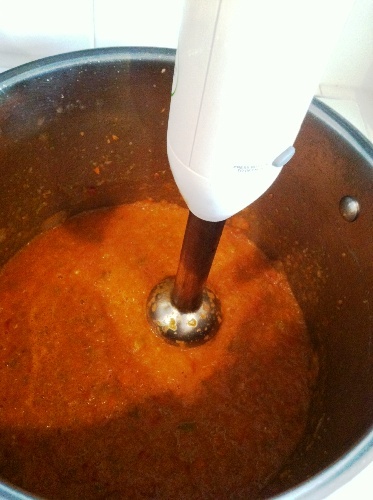 I love my immersion blender, for butternut roasted pepper soup, cream of tomato soup, tomato sauce with all the veggies. I limit my appliances, you could not tell by my comments posted here, bread machine, food processor, and now immersion blender…I also have a kitchen aid but I promise that is the end!! @Mary, ha. I’d like to think that I don’t have a lot of appliances, but when I think about it, I really do. @Mary, I like to think of quality appliances in the kitchen as a necessity to provide top quality home cooked meals for 5 or more people 7 days a week. They definately get put to use and their intial cost is offset by being able to make foods that I might not make if I did not have them. It would be hard to mow the lawn without a mower or play basket without a hoop or ball. My husband fully agrees I am more likely to make a great meal that we love if I have the appropriate equiptment to do the job well. @Stephanie, I married a contractor. He’s always big on the “right tools”. It’s wonderful justification when I really want something to help out in the kitchen. Love mine — long time user. If you get a model with the accessory cup/chopper, it extends the number of things you can do. No need for large equipment when small is all you need! Mine will chop a mountain of parsley, bread crumbs or nuts in a jiffy. 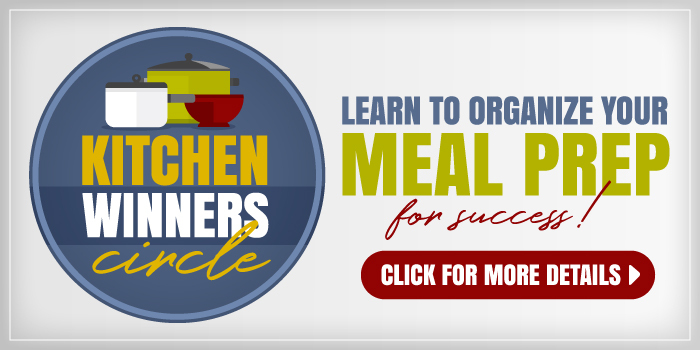 “Refried” beans or homemade baby foods with the stick blender — need I say more? I love my immersion blender. It is used mostly for salad dressings and soup. Our smoothie needs are too large for the immersion blender. 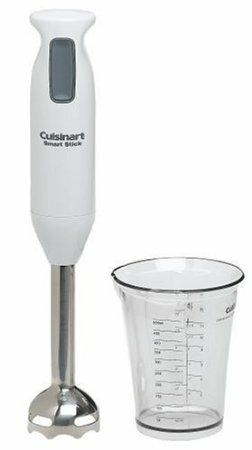 Our immersion blender fits nicely in a wide mouth jar–perfect for making salad dressing! I received mine 10 years ago for free from a packrat friend who was downsizing to become a missionary. I think it’s a Cuisinart. In all the years I’ve owned it, I have only used it for one thing, Tomato Basil Soup. 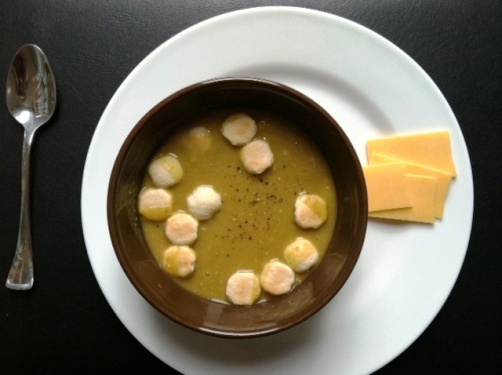 We love this soup w/grilled cheese sandwiches! So easy to make w/the immersion blender instead of having to transfer in batches to the blender — I would be so worried about getting scalded doing it that way. (I’m an RN on a Burn Unit so believe me, this sort of thing happens!) Also, I love all the comments to this post — great ideas about other things I could do with this appliance. Love to have that Tomato Basil soup recipe? Love, love, love our immersion blender. We use it almost daily. It gets used for mostly smoothies. It came with a cup but we use it in a wide mouth mason jar so we have more room. We also made all the baby food for our 2nd child with it and are using it for our 3rd. We use the food processor attachment a lot too! I just received one for my birthday last year, and it has made cooking so much easier! I now make soups and smoothies weekly and love it! Love mine! I have a bright red KitchenAid. I had one languishing in the cabinet for years. My mom always raved about hers, but I just never bothered to get mine out. One day, I had a wild hair and decided to use it for something. I was instantly hooked, and I use it a lot now. I should have listened to mom, huh? 🙂 It is mostly used for soups, but also applesauce and cranberry sauce. I don’t really have a nice tall cup that the blender base will fit down in, so I’ve been hesitant to try smoothies and milkshakes with it for fear of it splashing all over the place. I like the idea of putting it in a wide-mouth mason jar, though, so I might give that a try soon. I had a little grinder thing that I used to make baby food when my kid was small, but if I had a little one now, I’d just use this immersion blender instead. I’d be lost without my immersion blender. It makes an appearance pretty much whenever I make soup or a sauce. I’ve had my immersion blender for a few years, but had only ever used it to make baby food until a few nights ago. I used it to puree a soup and it was AMAZING! It was so quick, easy, and non-dish-dirtying… and I had fun using it! This post was perfectly timed – I can’t wait to use it again! Love, love, love mine! I was so tired of doing soups in the blender so we bought one that also has a small food processor and whisk. I love it and am so thankful every time I use it. The food processor isn’t as strong as my stand alone one but it is so much easier to clean I try to use it whenever I can. It was wonderful for making baby food. In summary, definitely some of the best ~$35 I’ve ever spent! I love mine. I especially love when it pulls itself to the bottom of the pan, and in wrestling it upwards I accidentally pull it a little way out of the sauce and splatter it everywhere! I use mine for many of the things already mentioned as well as crepe batter, quiche filling, and the egg mixture for french toast. I love how easy it is to clean. I love mine!! I use it for smoothies about 5x/week. Much faster to clean than a traditional blender. I’ve also used it for soups and homemade sauces. So much fun! On this one, I agree wholeheartedly. I’ve had the same Braun “whip stick” for years and years. Love it for refried beans, and especially for 1-minute homemade mayo (it fits perfectly in a wide-mouth pint jar). Many a failing sauce or gravy has been rescued with the immersion blender. I love my mine! I just got mine for Christmas and have already used to it to make smoothies and soups. I’m really not sure what I did without it! I love mine, it also comes with a mini food processor and whisk attachments which make it my most used small appliance in the kitchen. It makes quick work of homemade mayo and other sauces as well. I bought my immersion blender for one reason. I was having a terrible time getting the blender clean when I made my health smoothies and so I was losing motivation to make them. Now the blender is only used when I’m making milkshakes for a couple of people. I know this post is a couple months old, but I hope someone can answer this. If given the option of only having one would you go with a high quality immersion blender or a ninja blender? I don’t have a ninja, but for the price and storage space, the immersion makes more sense to me. But, it depends on what you want it for. Iove my Cuisinart Quick Stick! A hollandaise sauce takes less than a minute. dash of salt. It easy ! In a container add yolk & juice, mix while slowly pouring hot butter. The sauce will emulsfy. Season with salt & Tabasco. Yum! I love the blender by Karmin, works perfect! ?